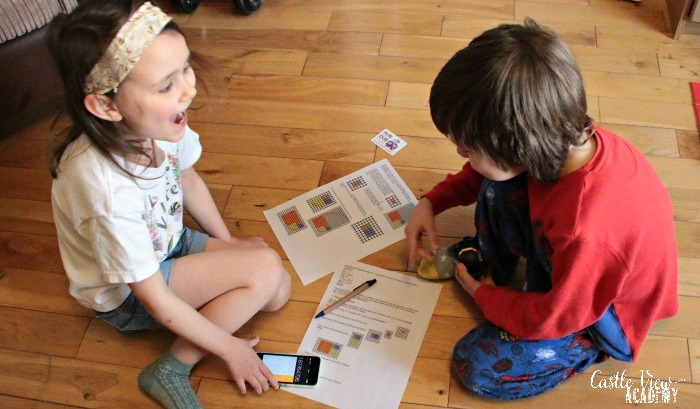 Over the past five weeks, my children have been learning all about Fibonacci numbers in every way (I didn’t know who Fibonacci was until then). 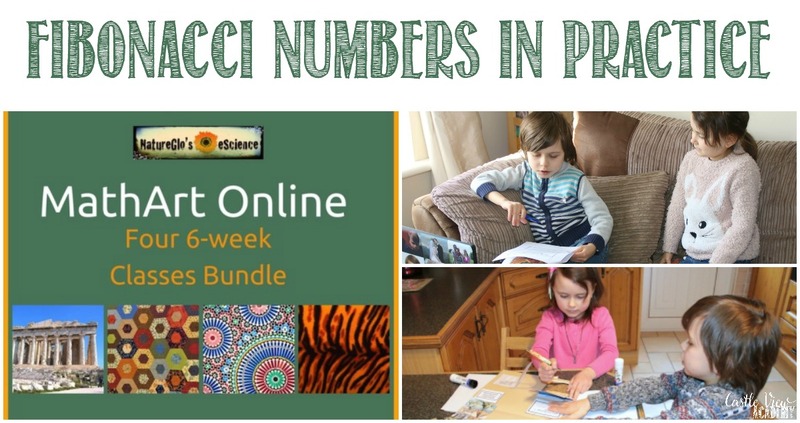 If you are interested in your child going deep into the ways math works in real life, then read our review of NatureGlo’s eScience MathArt Online 4-Class Bundle. Currently, we have full recorded access to the first two classes, while the last two classes are currently in session so we can join in live or watch the recordings shortly after. We started off with MathArt in Ancient Cultures, but after going through a lesson and a half (each lesson takes about a week to complete, depending on how many activities are completed and how deep into the topic each child goes), my children were finding that they wanted a change as this particular class wasn’t quite what they were expecting (although they do want to go back and complete it a little later). So then they started working on Math Connections With the Real World, which held their attention much better. 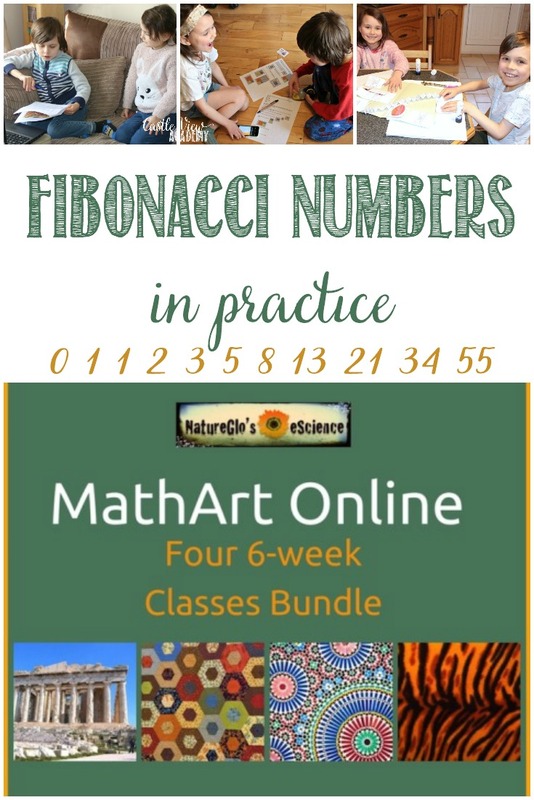 My children are just 10 and going on 8, and at the moment, and haven’t done a class like this before, so I think because Math Connections With the Real World began with explanations of what Fibanacci numbers are, this was a better foundation to start with. 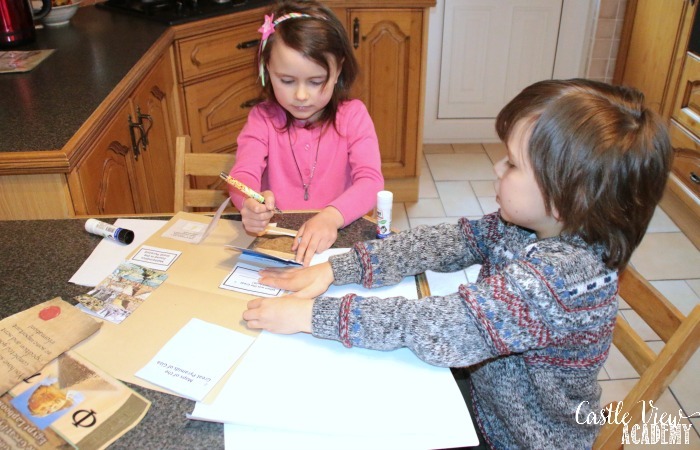 As you can see, there is a range of topics within this course that appeals to a wider range of personalities; my children were especially drawn to the topics on nature and the Great Pyramid. I will also say, that the more they learn in this class, the more they want to continue and learn more. Most weeks the children worked on this course on Monday, Wednesday, and Friday afternoons as project work rather than the usual everyday morning lessons. Sometimes it would only be for about an hour, but at other times it would be for the whole afternoon. I would have the print outs ready for them and then they would sit together at the PC or laptop and work through the lesson and answer the study guide questions together. Some of the math is above Tristan’s level still, and thus much ahead of Kallista, although she isn’t the target market of this class as it’s for 10+, but she doesn’t want to miss out anything that Tristan is learning and she was getting a good understanding of the subject. Between the two of them they did a great job of it. And because we didn’t join in the live classes, this gave them time to have discussions between them, just as they do in class. In the recorded sessions, what they heard was the audio between Gloria and the students who joined her class reading over the slides and discussing them. 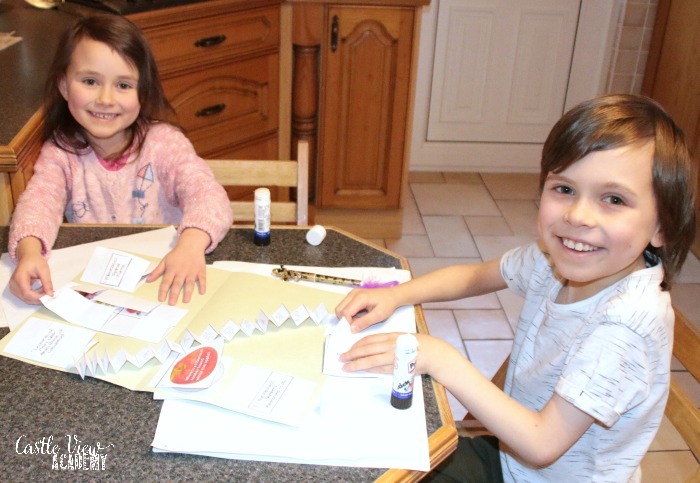 Then the rest of the work is self-paced and each child can adjust what they do according to their interests and abilities, using the many resources that Gloria provides, or even going beyond. Because my children are on the younger side of the course, they watched most of the videos (possibly more than I assigned), and a few of the projects that didn’t require too much independent research. 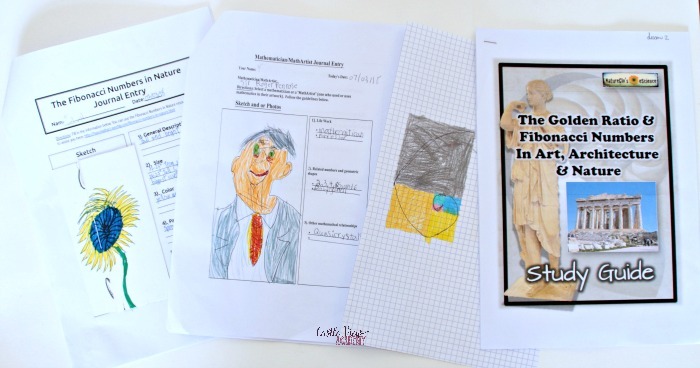 The children would work through each of the components of each lesson, marking them complete as they went and when they finished all of the components in one lesson, they received an ‘achievement’ picture that sat in their dashboard. When they finish the class, there will be a certificate to print and complete, which will be put on our kitchen wall. My children love lapbooks and were happy to find that there were two relatively easy ones to complete in this class. One was about nature and one was on the Great Pyramids. The Great Pyramid one will find its home in their binder of all things to do with Ancient Egypt. I tried to listen in as much as I could while the kids were watching the videos so that I could know a little about what they are learning about. It’s really surprising how much they’ve learned, and how they were able to walk into the library last week and have a conversation with one of the librarians about Fibonacci numbers! What a unique way to introduce yourself to a new librarian on her first day; why yes, we are homeschoolers – what gave that away? As spring is now trying to make its appearance, I’m sure the children will be finding the Golden Ratio all around them from the snails to the plants pushing their way up through the soil in the flowerbed…which will lead nicely into the next class they want to start next week, MathArt – Patterns in Nature. The children especially enjoyed the hands-on projects like the lapbooks, creating a spiral on graph paper, and making paper forms. They also enjoyed the videos more than the reading, but they are more visual learners, and some of the vocabulary was a bit difficult for Kallista to read. 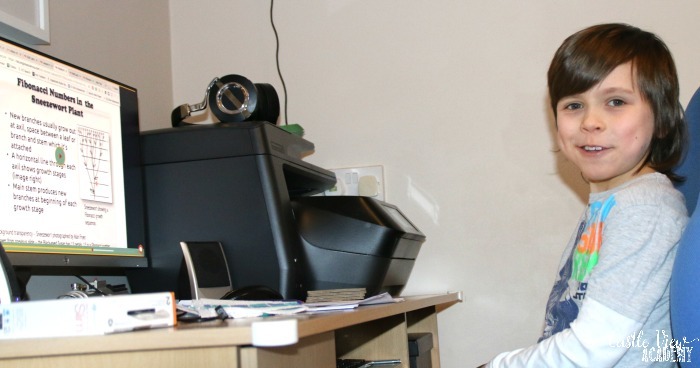 Which brings me to the fact that it is nice that there are many forms of media used in this class so that many types of learners can feel engaged. We all also liked the variety of the topics from nature to architecture to music; patterns are such a part of everyday life in so many ways that we don’t generally consciously think about. There was much more in this class than just math; it included culture, history, science, art, music, and historical figures. It didn’t seem to bother the kids too much, but I found moving through the lessons a little bit disjointed with all of the types of media; some to download, some to print, some to watch, some to open in external tabs, and some parts were embedded within frames on the NatureGlo eScience pages. It’s been interesting to see how the children have been applying what they’ve learned in real life and noticing Fibonacci numbers around them; knowing what is and is not a Fibonacci number, and what that means. One of my goals with this class was to get my children (especially Tristan) excited about math again as he used to love it but as it becomes more challenging, he’s not wanting to work as hard at it. I hoped that as he began to see it everywhere he looked and could see the connections between math and ‘life’ he might see things differently. In the past month long division has finally ‘clicked’ (could it be that there’s also a repeated process there? ), and this last weekend he completed his grade 4 math class and has begun grade 5. So yes, I think this class has helped him enjoy math class a little more. 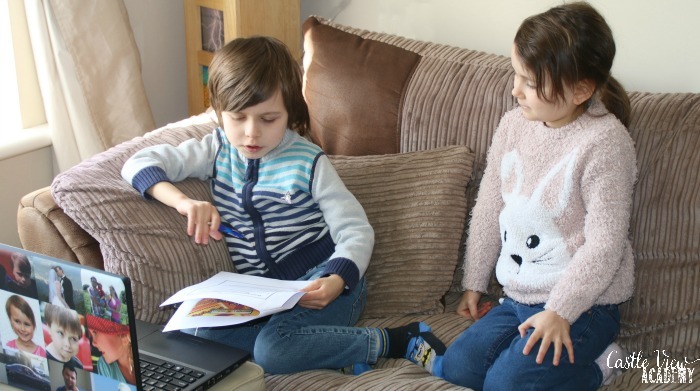 I wasn’t sure if my children were too young to get much out of the classes, but my worries were soon put to rest and I’m amazed at how much knowledge they’ve learned and the more they learn the more they want to keep learning. I was ready to give them a little break and come back to the next class in a couple of months, but no, they want to carry right on. That must speak for itself. 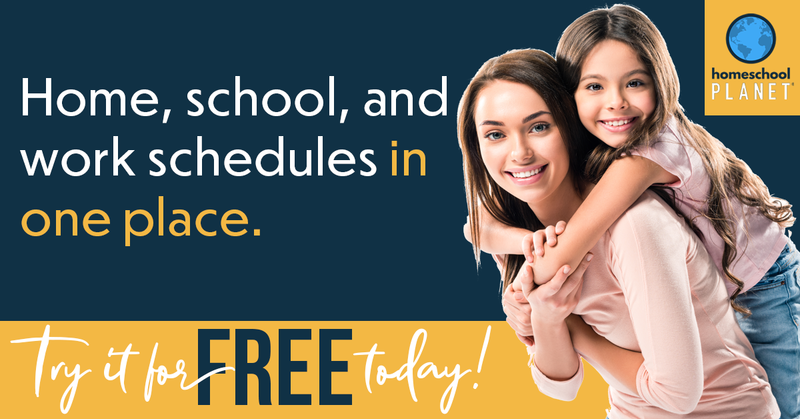 To read more reviews about NatureGlo by the Homeschool Review Crew, click on the graphic below and follow the instructions. You will find 70 honest reviews by the Crew. If you’d like to know more or would like to follow NatureGlo, you can connect with them through their website, Facebook, Twitter, Pinterest, YouTube, and Google+.